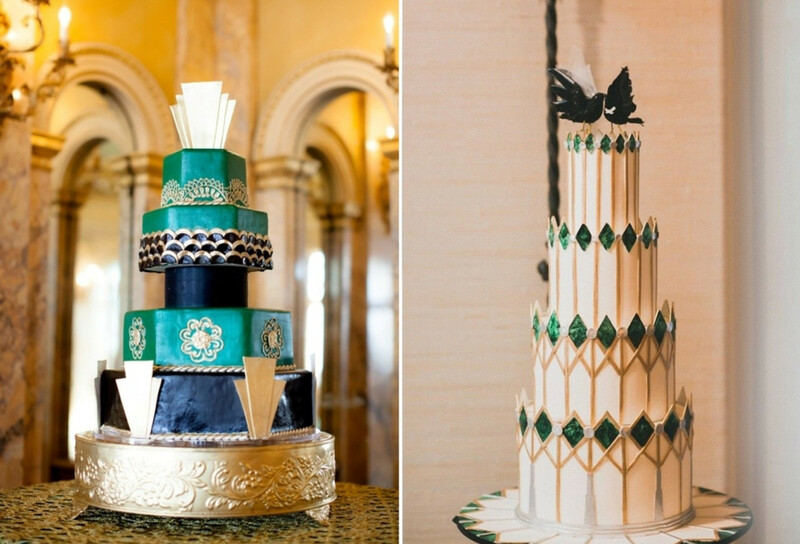 We've compiled our pick of art-deco-inspired wedding elements. Art deco is the predominant, decorative art style from the early 20th century characterized by repetitive geometric shapes and strong colors. Closely linked to the Great Gatsby novelty and the Roaring 20's theme for its similar timeframe, art deco has been really popular lately. 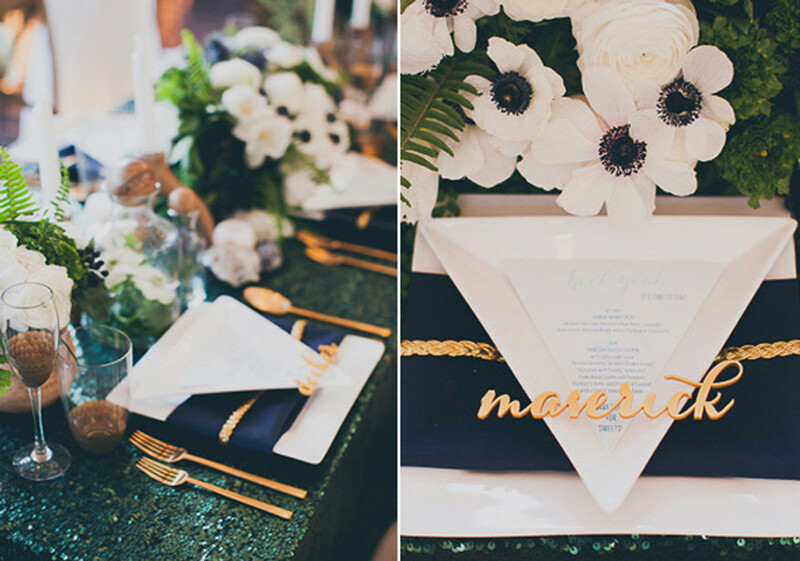 There are many ways you can incorporate artdeco inspirations to your wedding plan to create a splendid wedding experience for your guests. We'll take you through the terrific thematic process. First of all; invitations. 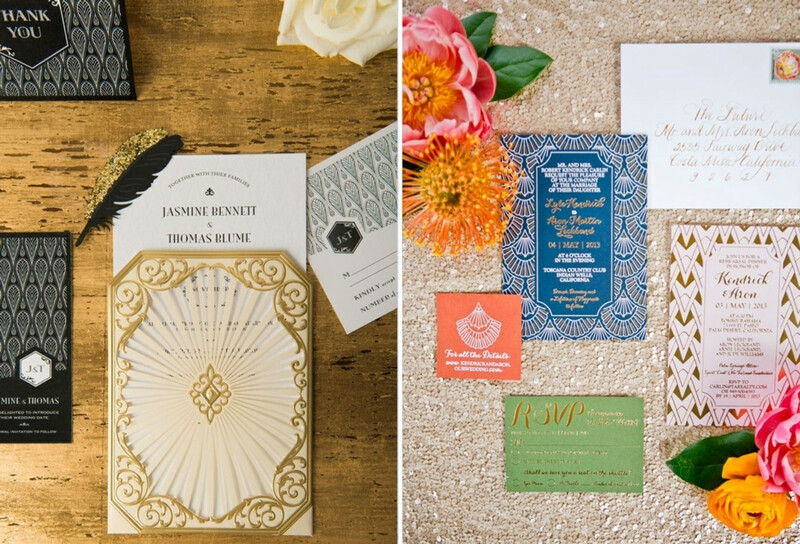 Incorporate graphic patterns into your stationary and use vibrant colors like cerulean, coral, or mint. If you want a more glamorous feel, spray in gold, silver, even glitter as accents. Just remember to not get too exuberant with patterns that will hinder your guests from reading the content comfortably. Going with a vivid bridal look is a sure guarantee for you to be the highlight of the night. 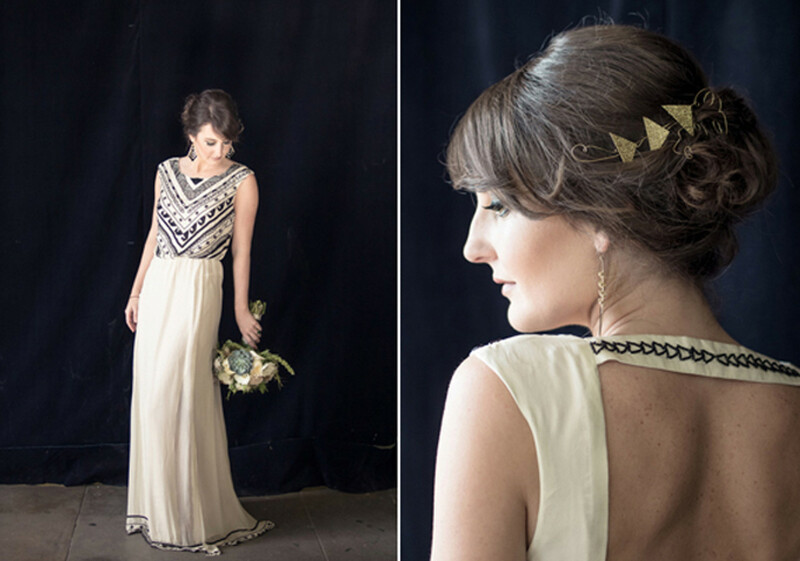 Put on a geometric printed wedding dress to really exude that art deco look. 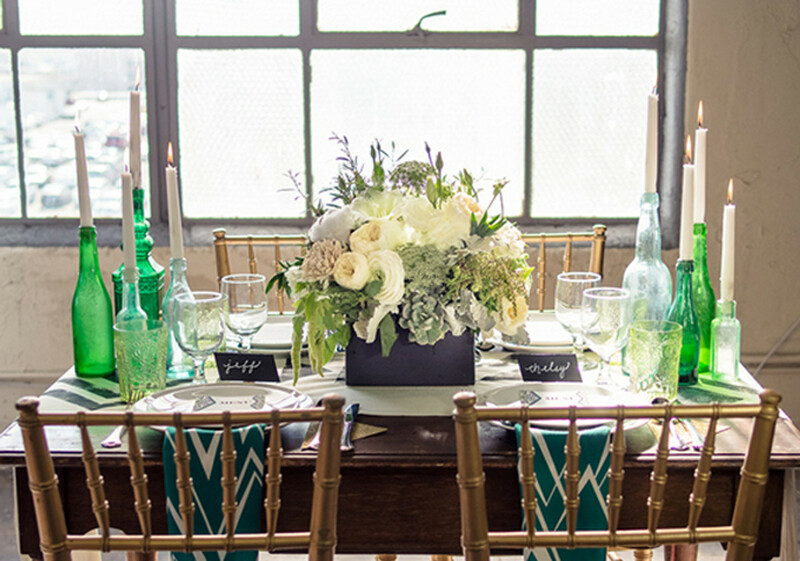 Don’t forget to compliment it with graphic accessories to really enhance the theme you’re carrying. The picture on the left shows a seating chart arrangement made out of linked strings. What makes it interesting is the fact that the strings coincided into geometric patterns that fits our theme. 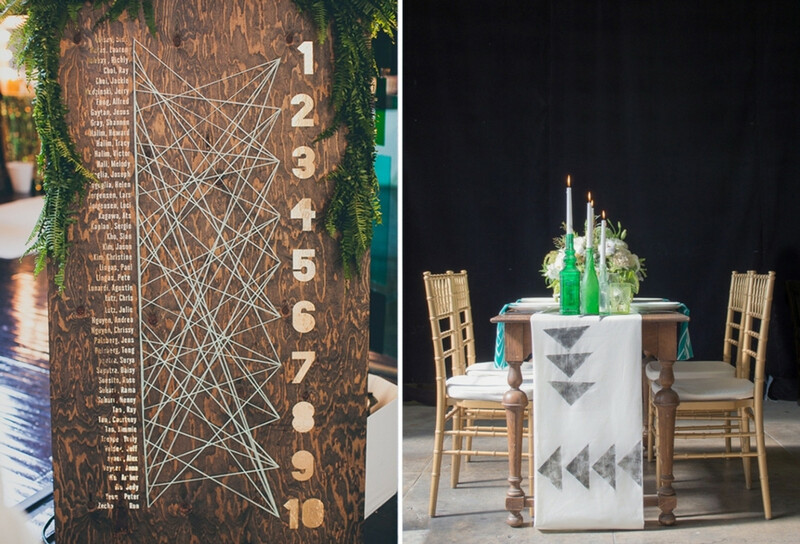 It is such a great idea for a seating chart to welcome your guests with geometrically decorated tables. To have the table menus that is consistent with the theme, decorated them with structural shapes hat seated on top of a printed napkin. Guests would have easily caught on your inspiration. It doesn’t stop there. As the food arrives, it will be served on a dish; not just a regular one, a triangular one. This is one of the best tHave the food served on special, triangular dishes instead of regular ones. This is one of the best ways to portray art deco, with a minor change that brings a great effect. rick we can suggest you. A minor change that harbors a great effect this one is. After a hearty meal, comes the time to cut the cake. As the cake hits the spotlight, imagine how in awe your guest will be looking at a wedding cake that resembles a work of art. You can either choose to have a cake with many different colors cake and shapes, or a simple one with predictable patterns. The unusual type and shape of the cake itself will fascinate your guests. 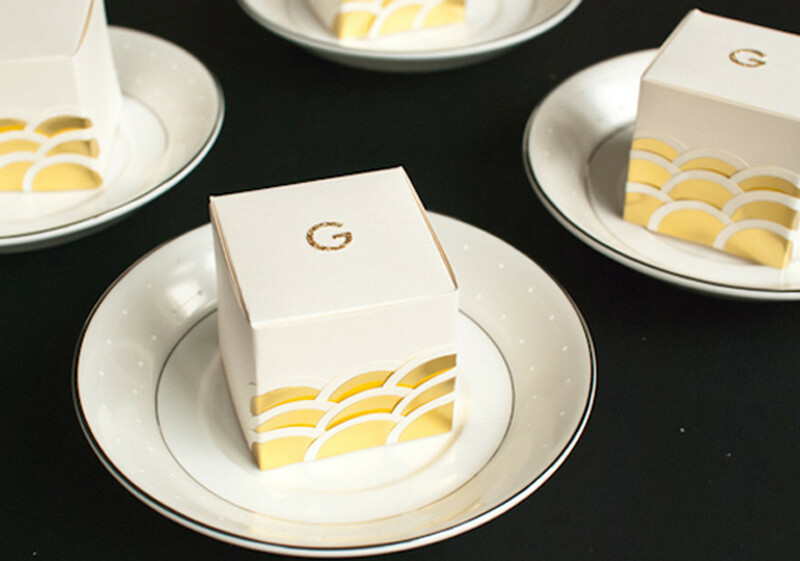 To finish the journey, present your guests with patterned favor boxes. It’s a sweet and simple finishing touch for the event.